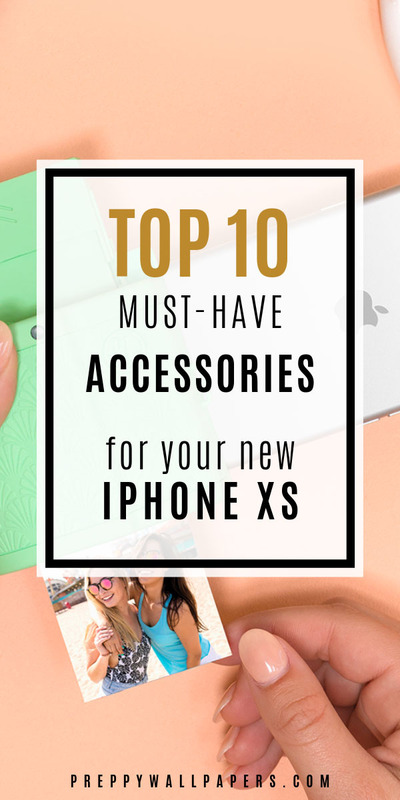 Looking for some gorgeous accessories and awesome gadgets for your new iPhone X, iPhone Xs, iPhone Xs Max, or iPhone XR? I’m pretty sure you’ll find all you need right here! Is there an accessory or gadget missing on this list? Let me know in the comments and I’ll make sure to take a look. There’s no such thing as having enough iPhone Xs accessories, am I right?! Here are my Top 10 must-have accessories and gadgets for your new iPhone Xs. First things first. The most important thing is to protect your new precious iPhone with a pretty case. 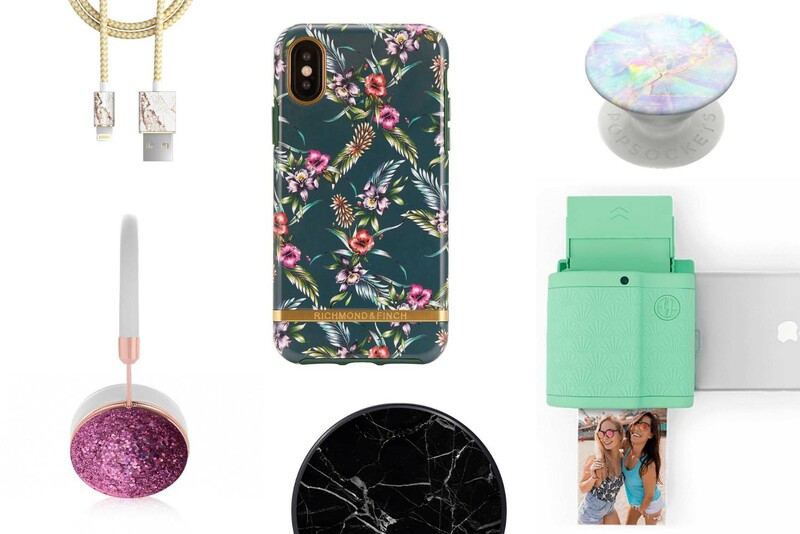 If you like cute floral and fashionable animal prints you will definitely want to check out the collection of iPhone cases by Swedish brand Richmond & Finch. All Richmond & Finch cases come with 360° drop protection and easy access to all buttons. The raised edges make sure your device, screen, and camera will always stay safe from clumsy accidents. Protect your iPhone in style at Richmondfinch.com (free shipping to Europe, Asia, and the U.S.). Don’t let all those gorgeous selfies go to waste. Do something fun with your iPhone photos and get yourself a Prynt Pocket. With the Prynt Pocket you can add a video inside your photo (!) and use the Prynt app to watch it come to life. Just like in Harry Potter, you’ll be able to re-live all your favorite moments and share them with your friends. The no ink necessary- photos are printed in just a few seconds directly onto zero ink Sticker Paper. Time to decorate EVERYTHING! Don’t let those pretty photos go to waste and get yourself the All New Prynt Pocket on Amazon. Your iPhone isn’t complete without a PopGrip from PopSockets. A PopGrip gives you that extra grip when holding your iPhone and makes it super easy to snap a selfie. You can also use it as a stand to watch your favorite videos or mount it to your wall or car. With the all-new Swappable PopGrip you can quickly change your style and match it with your favorite iPhone case. If you want to turn your iPhone into a powerful speaker, definitely check out the wireless Bluetooth speakers by JBL. You can wirelessly connect up to 2 smartphones or tablets to the speaker. Plus, the new JBL Charge 4 is waterproof and so the perfect speaker for on the beach or by the pool! All JBL wireless speakers and headphones can be found on JBL.com. Currently, JBL offers 60% off on selected products! There’s only one brand for lenses I would recommend and that’s olloclip. Olloclip has won loads of awards so I can’t be the only one that loves them! You can choose from Macro 7x + 14x + 21x Essential Lenses, Super-Wide + Telephoto Pro Lenses and a Fisheye lens. The Multi-Device Clip can be used with most cases and lets you easily swap lenses and switch between your front and back camera. Take your iPhone photography to the next level with lenses from Olloclip.com (free shipping to the U.S.). It seems you can’t go wrong with Swedish design. If you’re looking for a classy way to store away your iPhone take a look at these (velvet) clutches by iDeal of Sweden. All clutches come with a high-quality case included, which allows you to easily detach your phone when needed. The clutches are available in colors Green, Blue, Pink, Grey, and Black. Turn your iPhone into a stylish fashion accessory with a clutch from iDealofSweden.com (free shipping on all U.S. orders). For super stylish and comfortable headphones with beautiful sound quality, Frends is my favorite brand! I’ve been wearing my Taylor Oil Slick for years and I still get loads of compliments on them. Frends headphones come in the colors Gold, Rosegold and Gun Metal which all match perfectly with your new iPhone Xs. The caps are amazing and (most-importantly) interchangeable so you can easily swap them for a new look! All headphones come with a 3 button mic to remote-control your iPhone and music. You can choose between small size (Layla) and larger size (Taylor) headphones with the option to go wireless. Listen to your favorite tunes in style and get yourself a pair of Frends Headphones on Amazon. For all people that love everything marble (which would be me) this fashionable wireless charger by Richmond & Finch is just absolutely perfect. The minimal design takes up little space on your desk and it charges your iPhone in no time. In case you do need a cable, make sure to get yourself a matching Richmond & Finch Cable Winder. You’ll never have to untangle your wires and it’s an easy and compact way to store your charging cables. If you want to charge your iPhone on-the-go, you might want to consider popping one of these stylish portable chargers in your handbag. iDeal of Sweden designed some super stylish power banks in gold + the cutest floral print ever. With their matching cables and cases, you can definitely finish the look! When shopping at Richmond & Finch, make sure to add one of these super cute lipstick shaped marble portable chargers to your basket. They also come in a more classic compact variation. Well, there you have it! Ten awesome iPhone Xs accessories and gadgets for your new iPhone. Let me know your favorite in the comments! Want to see the cutest iPhone accessories and iPhone gadgets appear in your daily Pinterest feed? Make sure to follow Preppy on Pinterest and never miss out!